Steve- why are painted wolves the focus of this year’s Big Give Christmas Challenge? They are an extraordinary animal and their behaviour is unique. We’ve had a very chequered history with this animal. We’ve vilified it, and the early European settlers put a bounty on their heads convinced that they were going to be taking lots of live- stock. As a result, these animals were almost hunted to extinction. Now with agriculture creeping in and changing the landscape, we’ve hemmed these animals into tiny, geographically isolated populations – so they’ve got lots and lots of pressures against them. BUT amazingly they are one of the most iconic species locally. There are lots of myths and legends about them, they’re so well respected in folklore, and yet across the wider population globally they are not really that well understood or appreciated. We are a nation of dog lovers here, and these are a close living relative. There are so many familiar characteristics with our domestic dogs. They are beautiful animals up close, with their unusual markings and they have so many interesting collaborative behaviours within their packs. They are extraordinarily supportive of each other, looking after injured, sick and elderly animals, and it is their unique pack mentality that makes them the successful hunters that they are. As a vet I just think they are extraordinary. ‍Why do you think we have heard so little about them, until now? They are unbelievably difficult to work with. 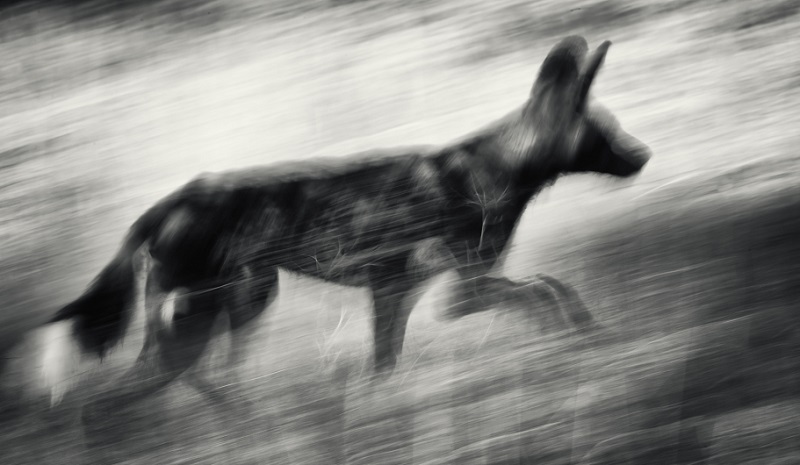 Unlike lions and hyenas, painted wolves live in the shadows, they are incredibly quick and they hunt through thickets. When you go out with your camera they are incredibly difficult to see. They are little ghosts that flit with through the trees and they hunt silently. My first trip to Africa I was incredibly fortunate to see them. We were driving along in the Okavanga Delta through thick bush land, and a little bush antelope sprinted across the path, so we stopped the engine to see what was coming. And then suddenly a pack of painted wolves came through. These things were like ghosts, they just slipped across the path, moving with purpose and then just disappeared. Our guide was incredibly excited. He couldn’t get over how rare a sighting that was. When they are so difficult to see, live such amazing lives but completely hidden from view, it’s a huge challenge to study them or to capture them on camera. Because of my filming background with painted dogs, I’ve done a couple of trips out to film them for TV, and off the back of that I was asked by Painted Dog Conservation to become a patron of the charity. 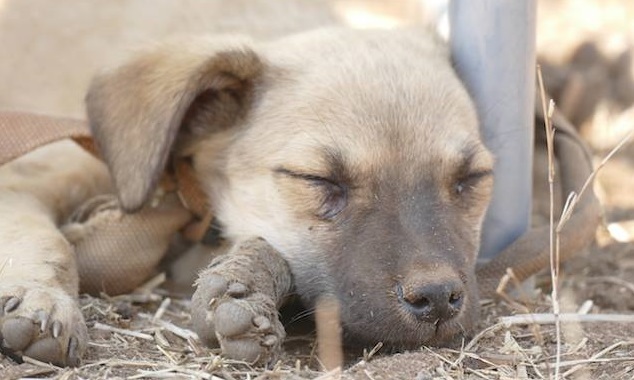 It is an extraordinary charity doing amazing work in Hwange National Park in Zimbabwe, during the most turbulent political times, to make sure these dogs had a future out there. But what they were really struggling with was veterinary input. Because there is so little infrastructure out there, veterinary support is very thin on the ground. 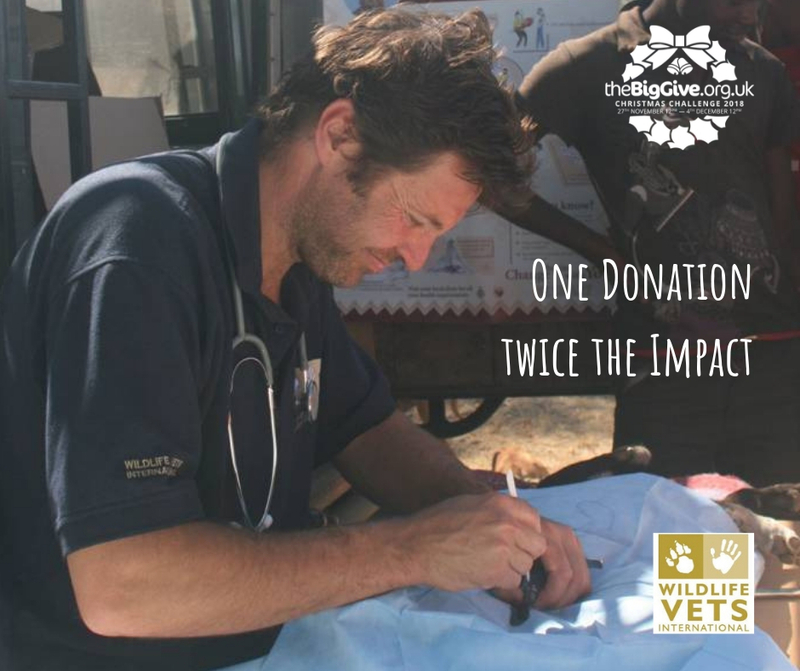 When I became one of the founding patrons of Wildlife Vets International back in 2007, I put the two organisations together because I could see exactly where help was needed. And so began these trips out to Zimbabwe to try to see what help we could offer. What we really needed to do was look at the bigger picture, which is what WVI is so good at doing. Diseases like distemper and rabies are a huge threat, and we don’t know how far infections like distemper have penetrated into the wildlife population. We are currently vaccinating the domestic dog population where it is rife, because if you can control it in the domestic dogs, then the chance of it spreading into the wildlife are massively diminished. And that, of course goes for Rabies as well. So the funds from the Christmas Challenge 2018 will go towards this vital vaccination programme and it won’t just benefit the painted wolves will it? One of the big problems that the local community in this part of Northern Zimbabwe have is with Canine Distemper and Rabies. Out there you regularly see dogs with clear signs of distemper, and rabies is a huge threat to the local people as well as their pets. So we pick a spot in between 2 or 3 villages and encourage the people to travel - It might be a cattle dipping station, or a clearing between some trees– and suddenly out of the trees about 10, 20, 30 people will appear with their dogs. 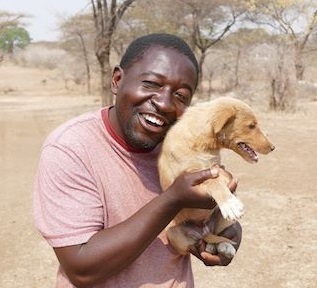 Each village has a head, and they will ensure that everybody in the village gets their dog vaccinated. These are very well educated people, even though they have very little means. They really understand the importance of making sure every dog is vaccinated and the importance of getting as wide a coverage as possible. They adore their pets and they will queue up all day to make sure they get their vaccination. So on the back of vaccinating the dogs to protect the wildlife we are also protecting the domestic animals and the people from some really life-threatening diseases. It protects people, it protects pets and it protects wildlife as well. let sleeping puppies lie (after their neutering operation). Credit Bethany Dixon. What WVI definitely need more than anything else is partnership with other organisations that have local knowledge. That is where Painted Dog Conservation UK is so vital. They have all the contacts already, they know the communities and they are very well regarded. Every time we do one of the clinics, we have painted dog conservation talking to the communities about the benefits and explaining the importance of keeping up with the rabies and distemper vaccinations and the importance of conserving the wildlife, particularly in bringing back tourism to the local area. It is a really well communicated and a well understood project. ‍A final word Steve on why you hope people will donate to our Big Give Painted Wolves Christmas Challenge. Why I’m really keen for people to get involved now is because I think there is now a real understanding of just how important these animals are. They have survived in the background, away from our attention. They have had to see off lions, they have had to see of hyenas and work collaboratively as a pack, and now they are having to adapt to human interference in their environment. And this is where humans can now turn around and assist these dogs and really get to know and understand just how incredible they are. If people can get involved and donate, especially in this period where donations are doubled and exceeding their target will allow WVI to apply for additional funding from The Big Give. This will make massive inroads into ensuring the survivability of these dogs and giving them a future, which they most richly deserve. Leftie is released following a remarkable recovery from horrendous injuries. Wildlife Vets International has always been closely involved with tiger conservation around the world. We currently work in Russia, Banglad..
WVI is a British charity which has been providing critical veterinary support to international wildlife and conservation projects since 2004. Written by an 8 year old!
" Saving some of the planet’s rarest creatures from extinction needs expert help, and WVI can supply that when and where it’s needed. " We rely on your donations. By supporting our work as we team up veterinary professionals and conservationists around the globe you can help save some of our most endangered species. WVI is a British charity which has been ensuring critical veterinary support for international wildlife and conservation projects since 2004. We are a small organisation with minimal administrative costs but access to top quality wildlife veterinary expertise across a wide range of different species. Sign up to get the latest WVI news about our conservation work and how you can help us delivered straight to your inbox.